Spirit the cat might be blind, but, as his name suggests, he doesn’t let his disability get in his way. When Spirit was just a kitten, he somehow managed to survive horrible abuse. Veterinarians believe that when Spirit was only 3- to 4-months-old, someone purposely punctured his eyes with a sharp object. After escaping his cruel abuser, Spirit spent weeks wandering the streets of Bryan-College Station, Texas, adapting to a world without sight. As fate would have it, Spirit used his four other senses to find what would become his new home. Since May 2012, his new owner has documented Spirit’s adventures on his very own Facebook page, hoping to inspire others with Spirit’s incredible story of survival and resilience. Even though Spirit can no longer see, the blind kitty still has quite a zest for exploring. And it is his curiosity and knack for detective work that makes Spirit, the blind rescue cat, the perfect cat rescuer himself. On April 14, Spirit’s owner got word of a possibly pregnant feral cat someone had trapped at a nearby construction site. When she brought the cat to the veterinarian, the doc explained that the feral cat had likely already given birth, and that her kittens were out there somewhere all alone. As temperatures dipped down into the thirties, Spirit’s owner headed over to the construction site with one goal in mind — to find the kittens. Luckily, she had a very talented sidekick on her search and rescue mission that evening. “We did not have any idea of what we might encounter, but we brought our Most Valuable Asset,” Spirit’s owner says of her incredible kitty. Spirit led his owner over to a trailer on the construction site, near where the feral mama cat had been trapped the night before. Using his exploration skills, Spirit found a small, low space beneath the trailer almost too small for humans to squeeze into but just perfect for a tiny litter of kittens. Sensing something his owner couldn’t, Spirit wriggled beneath the trailer and into the dark, damp space. Photos document the rescue mission, Spirit using his senses of smell and hearing to lead the rescuers closer and closer to the missing litter of kittens. It was Spirit who finally located the tiny kittens huddled together in the underside of the trailer, meowing in a bit of pipe insulation. Thanks to Spirit, his owner was able to help pull four kitties to safety that day. The kittens’ mom has since been spayed, and now she lives outside of one of the construction worker’s homes. 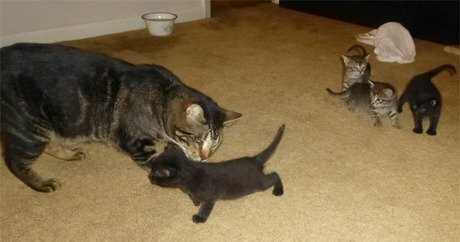 Too small to eat food on their own, the little kitties have a new foster mom, CC, who is nursing them alongside five kittens of her own. As for Spirit, he is busy playing proud uncle to the adorable kittens he helped to save. If you’d like to continue following Spirit’s story, or to see more photos of the kittens as they grow, make sure to follow Spirit on his popular Facebook page.